The 2016 general election and its aftermath broke all the unwritten Facebook rules. It used to be that politics were off limits on social media. Facebook was the place to find out that your friends were expecting a baby, had started a new job, or that their kids’ team had won a championship. In the months leading up to – and time following the 2016 general election – Facebook feeds are overwhelmingly filled with an unending supply of vitriol from both sides of the spectrum. So much so, that long-time users (myself included) are scaling back their social media interactions, unfollowing or blocking friends and taking a break from, or signing off for good. What’s a small business or brand to do? Simply put, with more and more people tuning out, organizations need to post smarter on Facebook. Let’s face it, with more than 1 billion active users, Facebook is still the best place for a small business or nonprofit organization to build brand awareness, engage with customers, find prospects and sell goods and services. Make an offer your followers can’t refuse. Who doesn’t like a good deal? Create a Facebook-only offer or a special giveaway. Tip: To increase engagement and reach, consider selecting a target audience and sponsoring your post. Prove that seeing is believing. Use eye-catching photographs – or better yet video – to grab your followers’ attention.Tip: Reference a current offering or limited-time-only deal for an added bonus and keep videos short. A few seconds of impactful video will do the trick. Polls are popular ways to engage with followers on Facebook. Share the inside story about how your business started or give your followers a behind-the-scenes glimpse at day-to-day life. Tip: Shoot for authenticity in all of your personal interactions. Listen – and respond – to conversations. Keep tabs on what your followers are talking about. Determine strategic ways your brand can join in and add to the conversation. Tip: Peruse conversations among your competition and like businesses to see how their followers respond. Coming up with a social media strategy for Facebook, or any social media platform, takes planning, execution and a certain degree of trial and error. We can help lessen the learning curve! Don't miss any news! Sign up for our mailing list. 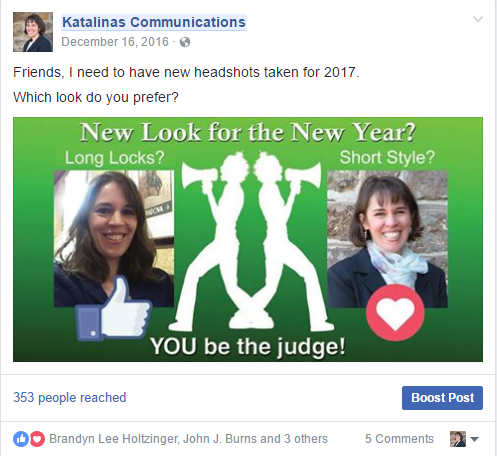 Previous post Should You Hire a PR and Marketing Pro?